Welcome to a virtual tour of Lichfield through these pages where we set out to give you, as a visitor to our city, a flavour of the city itself, it's history, culture and events that occur regularly over the calendar year. You may progress from page to page via the links at the bottom of each page, or if you have specific questions, you may follow the index links that will appear above. As each place is described, if there is a web page for that site, it will be linked so that you may learn more about it from that site - then please feel free to come back and progress further. 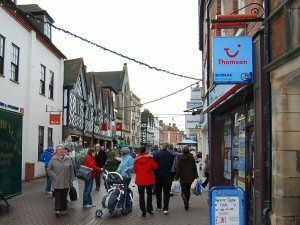 Where better to start a tour than from the Tourist Information Office, where they can book your accommodation, and give or send you information about places to see around our city. If you click [ HERE ], you will be taken to their web site to learn more of what they offer. Meanwhile, their telephone number is: 01543 256611. Tourist Information Office opening hours: Monday to Saturday 9.30am - 3.30pm. 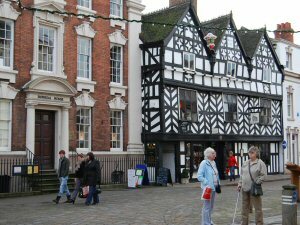 The Tourist Office is now housed at St Mary's Heritage Centre in the Market Place and picture on City Centre. Donegal House pictured, is a Georgian style building and from time to time entertains local art exhibitions and charity sale offices on the ground floor on the left. When you have visited the Donegal House, you can go next door, to the building on the right, the Tudor Cafe, believed to have been built in 1501, and read up on some of the literature you have obtained. The cafe serves light meals and also specialises in chocolate creations not helpful to those intent on dieting. Upstairs there are antiques to see and buy in plenty, and worthy of a visit if only to see the upper rooms of this interesting old building. 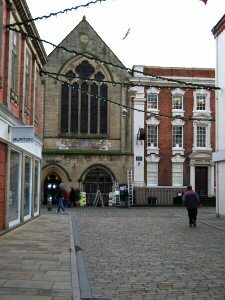 Before we leave this area, we should make mention of the Guildhall, which is the building to its left and which appears to have been the centre of law enforcement at some time in the past, and where you can visit the cells where prisoners were kept, at the rear of the ground floor, probably before being sentenced to be burned at the stake in the market square. There has been a building on this site since 1387 and the present building dates from a substantial re-construction in 1846. Outside here, George V was proclaimed king, and it has seen Queen Victoria at least twice. Today you may find the old civic meeting rooms hired out to local fairs or to market people to sell their wares. 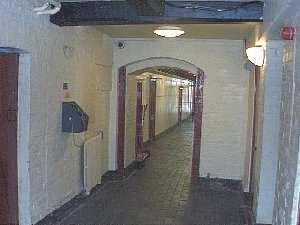 The cells are open to visitors, normally on a Saturday morning but enquire at the Tourist Office. Last updated: July 11th, 2014.